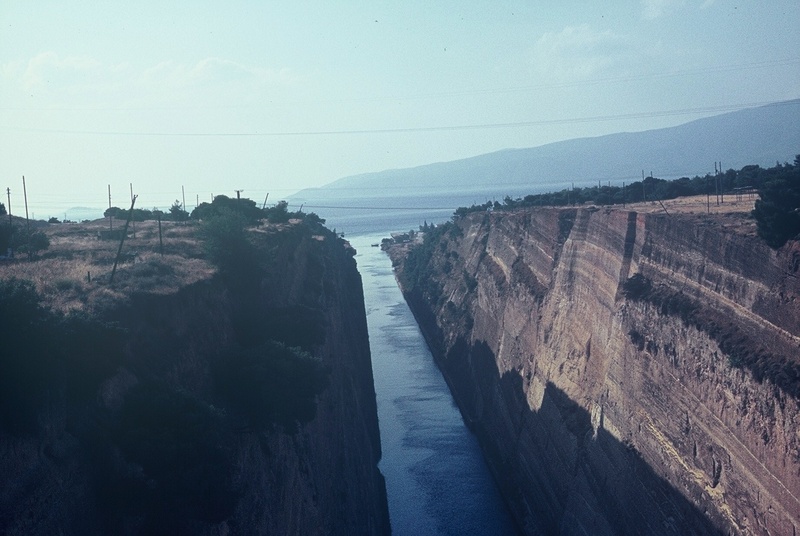 The Corinth Canal divides Attica from the Peloponnese. It is over 6 km long, hewn into solid marble. It was dug at the end of the 19th century. When we first crossed the canal in the late sixties there was a single railway bridge of metal framework and a concrete road bridge with a single lane running either way. There was a toll as you left Attica, even in the early days, the only toll in Greece for a long time. I seem to remember that we would stop on the Corinthian side, in Peloponnese, to stretch our legs, have a cool drink and ham and yellow cheese sandwich on sterile bread. There was a curio shop that sold miniature Corinthian bronze warriors alongside beach bags and hats. It was an event to cross the canal in those days. One would marvel at many aspects of it. The bright light reflected off the steep white walls of the canal, the blue ribbon of water shimmered at the bottom and the ships passing almost touched the edges. The ships looked so small so far below the bridge. The old bridge had an expanded metal pedestrian walkway which was nerve wracking. I always felt pulled down as I peered over the rail into the canal. From the canal the next landmark was the ruin of Mycenae above the Argolid plains. A divide between modern and ancient times. A divide between Indo-European culture from 2000 years B.C. and the Greek civilisation..
From Mycenae the central mountains of the Peloponnese rise, sharp, rocky and sparsely covered, towards Arcadia. The Artemision Tunnel now funnels traffic through to Tripolis, almost 100 years after the canal separated the Peloponnese from Attica. Now the trip from the new airport to the village is a two hour drive. In the sixties we needed to stay a few days in Athens to acclimatise, then drive through and stop at the canal. From there to Argos for souvlakia and to avoid the high mountains, before the tunnel was built. Now we rush through and sense nothing was we speed through the dry landscape fringed by sea up to the mountains. There was no air conditioning on those days. Some of the trips were undertaken by train , some by bus, until my father organised a taxi to collect us and deliver us home. Why the divide? Geographic. Cultural. Chronological.